“MEART – The Semi Living Artist” is a geographically detached, bio-cybernetic research and development project exploring aspects of creativity and artistry in the age of new biological technologies. It was developed and hosted by SymbioticA – The Art & Science Collaborative Research Lab, University of Western Australia. MEART is an installation distributed between two (or more) locations in the world. Its “brain” consists of cultured nerve cells that grow and live in a neuro-engineering lab, in Georgia institute of Technology, Atlanta, USA (Dr. Steve Potter’s lab). 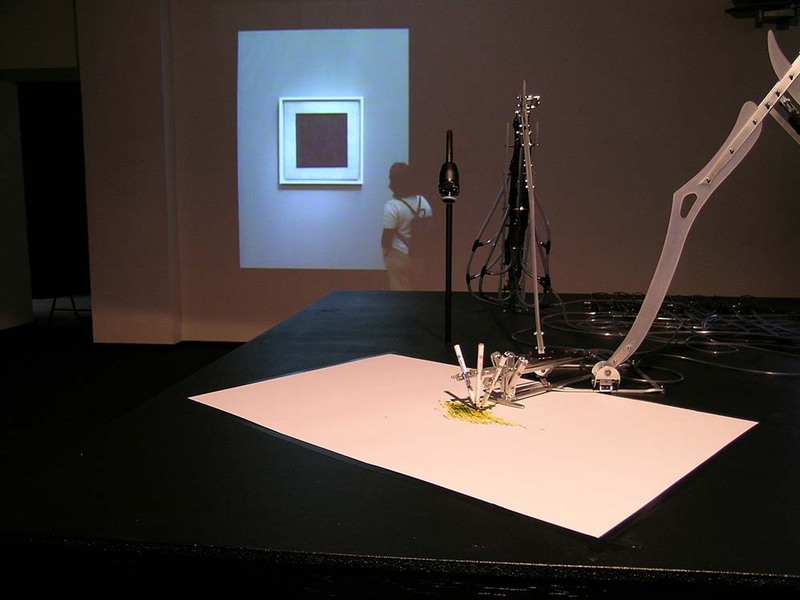 Its “body” is a robotic drawing arm that is capable of producing two-dimensional drawings. The “brain” and the “body” will communicate in real time with each other for the duration of the exhibition. ‘Wetware’ – neurons from embryonic rat cortex grown over a Multi Electrode Array. ‘Software’ – that interfaces between the wetware and the hardware. The Internet is used to mediate between its components and overcome its geographical detachment. MEART is suggesting future scenarios where humans will create/grow/manufacture intuitive and creative “thinking entities” that could be intelligent and unpredictable beings. They may be created by humans for anthropocentric use, but as they will be creative and unpredictable they might not necessarily stay the way they were originally intended. We refer to the wetware/software/hardware hybrid we have created as a Semi-Living artist as it is made of both living and artificial components; part grown – part constructed. While the artistic values of the outcomes of the process (the marks on paper left by the drawing arm) are still in the eye of the beholder, the questions regarding the possibilities are real. What will happen when such a system starts to express qualities that are considered uniquely human aptitudes such as art? Its identity extends beyond our cultural comprehension of living systems. Made from living biological matter, mechanics and electronics simultaneously, it questions the viewer’s perceptions of the concept of sentience. MEART has a technologically created identity. It is an identity created as a result of the progression and combination of various technologies. Its “brain” is growing in Atlanta and its “body” (or multi bodies) could be anywhere in the world thus highlighting the ubiquitous nature of its existence and identity. This work explores questions such as: What is creativity? What creates value in art? One way of looking at these issues might be by thinking about creativity along a spectrum, from a reductionist mechanical device, to an artistic genius. What is it that makes a person a genius? Perhaps it is the ability to link together diverse inputs. We hope that our cultured neurons will have the potential to show signs of very basic “learning” or “creativity”. MEART has the ability to sense the outside world through a camera that acts as its eyes. It has the ability to process what it sees through the neurons that act as its brain. It has the ability to react accordingly through the robotic drawing arm that acts as its body. The Internet functions as its nervous system. MEART is a geographically detached entity ubiquitous on many levels. We have set up living neural cultures (“MEART’s Brain”) in Dr. Steve Potter’s lab at Georgia Institute of Technology, Atlanta . Potter is one of the leading neuroscientists in the field of “Learning in Vitro” and is developing a new paradigm for neurobiology research. He is applying different technologies to study dissociated cultures of hundreds or thousands of mammalian neurons. This piece traces its influences from an array of artistic, scientific and technological streams. Areas such as interactive art, cybernetics, kinetic and robotic art, artificial life/intelligence and biology are all linked to the project. Other influences are the different representations and use of animals in contemporary arts, from the use of elephants to produce “art” to the use of living and recently living animals/bodies (or parts of the body) as art works. From an historical context, artists have always been concerned with imitating life and with giving life/animating qualities to non-living entities. Technology has also joined forces with art forms to create more sophisticated types of artificial life systems and “intelligent” machines. The uniqueness of MEART is the attempt to create an intelligent artificial/biological artist that has in itself the capability or potential to be creative. We are focusing on creating the artist rather than the artwork. MEART proposes to embody the fusion of biology and the machine – creativity emerging from a semi-living entity. We exhibited the The Portrait Series in several exhibitions (Perth, NYC, Bilbao & Melbourne). 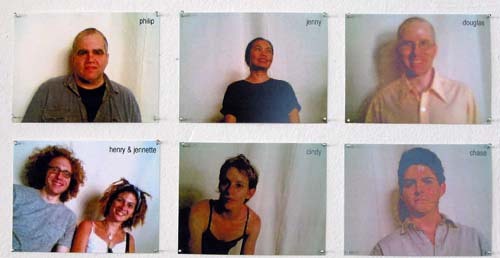 In these exhibitions MEART was drawing portraits of visitors in the Gallery. Artists have been given a gift with their art to extend the substance of life, but not to overload it with useless copies and representations. No matter how well the artist imitates, his artworks will be lifeless, but when he creates a new form and implements it, only then will this form have life and truth. If this happens, the saying that “art is a lie” will have no reason to exist. “Overturn. The path of art without creativity”. The Black Square is the fourth phase of MEART, developed in collaboration with The Ultrafuturo Group. This phase connects MEART with the ideas of Suprematism, re-discovered as visionary for the development of new technology. In this installation MEART is taking its inspiration from Malevich’s painting “the Black Square ”. The Black Square is considered to be the beginning of a new and redefined art. The Suprematist paintings are projects for and instruments of a new universe and a new system of the world. The Suprematist canvases were sign-projects, containing images of the technical organisms of the future Suprematist world. In our case MEART is not only a “project” but already a real organism, an organism existing in reality, a realized project of the futurist’s/Suprematist’s dreams. The Black Square constitute s both “all” and “nothing” – both “non-objectivity” and “omni-objectivity”. In Suprematist theory it represents the embryo of all possibilities. In other words, the Black Square could be called “the creative particle” (cell) of every single existing image. Digital technology gives us another name for the Black Square – the Pixel. This analogy is not the only reason for building the connection between MEART and Suprematist theory. Another very important reason is that Malevich himself predicted the emergence of creative “thinking entities”. Until now MEART has been inspired by visitors to the gallery and has been drawing their portraits. In this phase (exhibited in ART Digital 2004), MEART will be drawing ‘the black square’ not only for its visual properties but also for its conceptual value. By reducing the input to the neurons to a simple geometric shape – The Black Square, we are giving MEART a task that it should be able to cope with efficiently and thus allow us to examine the relationship between the input (stimulation – the black square) and the output (the drawings that result from the stimulation to the neurons), to try and detect some sort of an emergent behaviour of this semi living entity. The action of MEART observing and drawing the Black Square explores the fundamentals of visual creativity and the way we communicate with the world through images, symbols and their underlying meanings. Born in England, trained and worked as a gem cutter in Canada before moving to Australia and migrating into the arts where he graduated with a Honours Degree in Fine Art (sculpture). Specialises in the use of mechanics, electronics, and robotics to create kinetic art. Current artworks utilise motion and light to investigate technological aspects of today’s culture, the overlap of art and science and the re-use of obsolete and discarded materials. The physical forces and structures within nature are of great interest to him and are a constant reference in his work. Born in USA, lived in Slovakia and France. Received a BS and MS in Mechanical Engineering which provided insight into the workings of the physical world, but he is now interested in the workings of the mind and its perception of the physical world. Currently a doctoral student in the Bioengineering Department at Georgia Tech under the guidance of Steve Potter. Interested in embodying cultured neurons with robots to study the importance of environment in the processes of neural networks. is the product of an artistic mother and a scientific father, who fostered both creativity and curiosity. As a result, he is perhaps more interested in the aesthetics and presentation of scientific data than most scientists, eager to make it interesting for the general public. He got his undergraduate degree in biochemistry at the Univ. of California, San Diego, and his PhD in neurobiology at the Univ. of California, Irvine. He worked as a postdoctoral scientist 8 years at the California Institute of Technology, developing tools to study living neuronal networks. He is now a professor of Biomedical Engineering at Georgia Institute of Technology in Atlanta. Through an eclectic and undistinguished career Iain Sweetman is uniquely unqualified in, but has at one time or another earned a living from; photography, bacteriology, pulmonary physiology, bass playing, record production, sound engineering, neurobiologly, forensic anthropology, maths, applied computer science, network administration, artificial intelligence, strange art projects involving fish and robots and, tentatively, haptics . He still does not know what he wants to do with his life, but if he ever gets paid what he thinks the world owes him, travelling around the world with a bicycle, a tent and a credit card is a strong possibility. Born in Finland, lived in Israel and Australia. Co-Founder and Artistic Director of SymbioticA – The Art & Science Collaborative Research Laboratory at The School of Anatomy & Human Biology, University of Western Australia. Founder of the Tissue Culture and Art Project (1996). Research fellow at The Tissue Engineering & Organ Fabrication Laboratory, Massachusetts General Hospital, Harvard Medical School (2000-2001). Trained in product design, and specialized in the future interaction of design and biological derived technologies. Co-founder of SymbioticA, the first art and biology lab situated in a science department. Consults and lectures on the nexus between Art/Science and Technology, the Philosophy and History of Science. Exhibited in Ars Electronica and collaborated or helped produce a number of biotech art pieces revolving around emergent technologies in the biosciences. Background in science (developmental neuroscience lab, D Phil in Natural Philosophy, Oxford), senator at the University of Western Australia, chief executive biomedical software spin off company, Paradigm Diagnostics, and founder of the Image Acquisition and Analysis Facility, UWA.